OK you ATG watch experts, collectors, and enthusiasts--What is the ultimate aviator's watch? I know everyone at ATG loves Bremont, and not everyone can say the Rolex GMT. Breitling has many, but they advertise it into our brains. What others are out there? Can be vintage or new. Quartz or mechanical. Just has to have an aviation feel to it. I need a new watch for my wish list. This type of thread may have been run before, but I've not seen it. I would tend to say the most reliable... historically would it be the 806 Navitimer (the original) of the Omega Speedmaster however, as they are manual I would probably go with my Bremont, as it has been by far the most reliable pilot watch I have owned. Maybe my 5513 Submariner or my Rolex GMT was pretty close too! I'll post a full list of the ones I have owned but Rich if you look through the galleries virtually all of the true aviator watches are there... maybe a Czech Longines although there should be the Lemania version in military watches.. have a look, I'll add over the weekend. The IWC you have could be said to be or the Big pilot but I think they lack a bit of soul! So what are they? F15 Eagle, A10 Warthog, P-51 Mustang and a F-18 Hornet? It's hard to judge just on pictures, as great as they are. 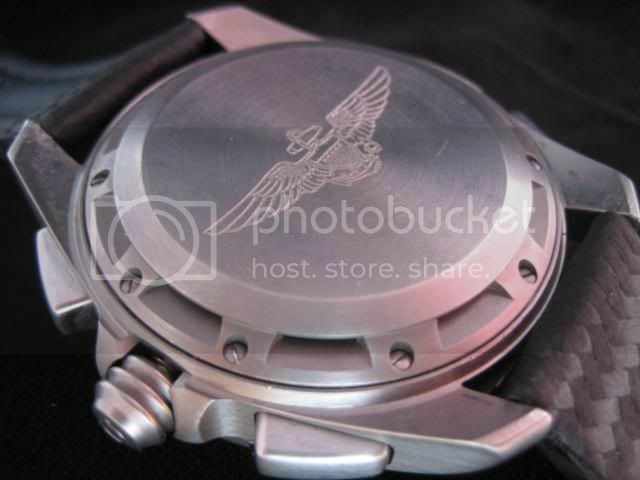 I was looking also for some opinions, history, and specific functions or styles your forum members like in an aviator watch. Also how they feel on the wrist, size, etc. I think my favorite in my modest collection is a 1985 Tag Heuer Automatic Pilot Specialist (all markings except the dial say only Heuer). Just like the look and feel of it. It's not the most expensive nor "legendary", but a good pilot watch. So come on...what others? Dude, 00.38 here and I just got woken by the wind... I re inserted your pick but you should load them in a gallery, takes maybe 10 ins to load 20 shots then you got them for good. Anyway, it's a good question and this is a good place to get an answer... I will address this question over the weekend and give my ATG 'guns'. Meanwhile, as a non pilot it would be interesting to know what a modern pilot flying the most modern of aircraft uses a watch for...? are you thinking of buying vintage or just supposing? I'd think that the Breitling has to be up there somewhere. Chronomat is a classic, and the B1 seems to mix the old and the new quite successfully. You've covered the emergency already. Down the pecking order and in the more accessible box, Seiko have obviously been quite popular with pilots for some time. Having supplied a few watches to the RAF, they moved into the domestic market with their slide rule chronos, and have produced mechanical and ani-digital versions. Alternatively, if we're really getting into wrist instruments, Suunto X9M/X10? Gets you backup GPS, altimeter, compass. But no chrono. Alistair--I will look at posting to a gallery. By the way, you got all the jets right except for the F-16 (vs F-18). When I was flying the F-15, I needed my watch to hold a perfect time hack. That was probably the most important. I actually used a Casio G-Shock with atomic clock updates. All the pilots in a formation needed to set the jet's internal clock to exactly the same time for missile shot comparisons, etc. I also needed a good backlight or lume hands for night flying. 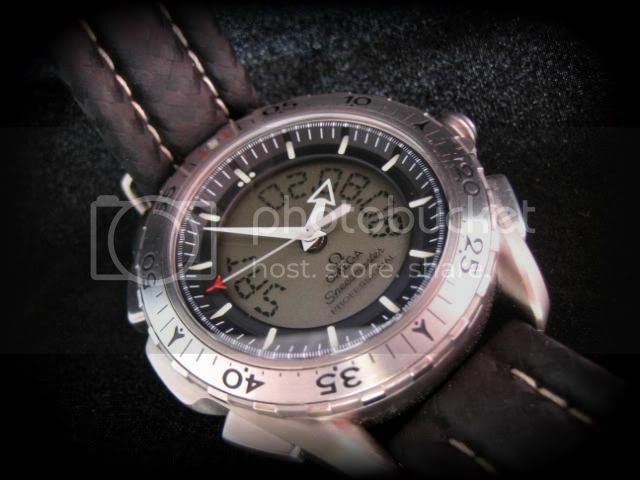 A chronograph for short duration timing of events was also important. The slide rules and such on aviator watches I never used. They just look cool. The X-33's mission timer is a nice feature, for flight duration and logging time. The Breitling Emergency transmitter function is unique, but there's a much stronger beacon in the parachute harness, so not sure that I would ever trash my watch unless I knew the harness beacon wasn't working. I also needed the watch to be tough. It would get slammed on the cockpit rails and different places in the cockpit--that's why I usually didn't wear a "nice" watch when flying combat training missions. But outside of actually flying, the most important feature is that it looks good with the flight suit sleeves rolled up in the bar telling stories. Fighter pilots usually like a big watch and use their hands to re-create a dogfight. We used to joke about "shooting the watch". A fighter pilot walks into a pub after a day of flying and strikes a conversation with a beautiful woman seated at the bar. After several drinks and smooth conversation, the woman comments on his large complicated watch. He tells the woman, "that's a pilot's watch, and it can do much more than tell me the time." She says, "what else can it do?" He says, "it can tell me intimate details about women." The woman raises her eyebrows and says, "what does it tell you about me?" The pilot says, "it's telling me you aren't wearing any underwear." The woman laughs and says, "well, it's not correct, because I am wearing underwear." The pilot looks at the watch again, taps on it, and says, "darn it, the thing's running an hour fast." Look forward to more inputs. It may be a vintage pilot watch I would like to save for next. To Flashharry--I am very impressed with the X-33. I just got one a week ago. I put some pictures of it on the post that Alistair started on what new watches people have aquired. 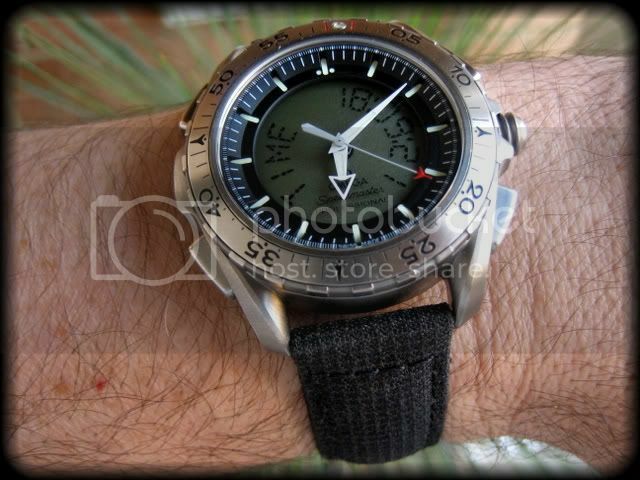 OK, from what you have written it seems to me that the most perfect pilot watch is the Omega X - 33, I've owned one below and under that is an excellent review from a few years ago by a pilot. Well i think you have an X-33 for flying and you are certainly covered for the cool big pilot watch for bar chatting with your excellent IWC flieger and Bremont ALT1-Z so what you are really saying is what vintage watches are available to me and why right? The below pic is part of my collection about 4 years ago.. any one of those would do but they also give you an idea of size... the Monaco is slightly wider than the new one so you can work out sizes from that. Classic Moonwatch Omega Speedmaster .861 40mm manual wind (in my opinion this is the 'classic' vintage watch to own, whether you be pilot or not... funny I don't have one at the moment but I have owned about 15.. Lol! There is always the Heuer Bund, large and impressive, manual and light ... not much point me saying anything as DaveS wrote a great article comparing this watch to it's successor made by Sinn - they are still available from Sinn I believe and not that pricey.. So Rich, here is my take on the pilot watch, it's a big question and I hope I have provided some mussings for you... read the posts RE. vintage watches as the 'source is all there'. Sorry for banging on about the galleries but I bought them for you guys to use....and there are loads of other pilot watches in the galleries that I will have missed, some of the info here is a little anecdotal so don't hold me to all of it... just a distilled taste eh? If you need any other steer let me know....?